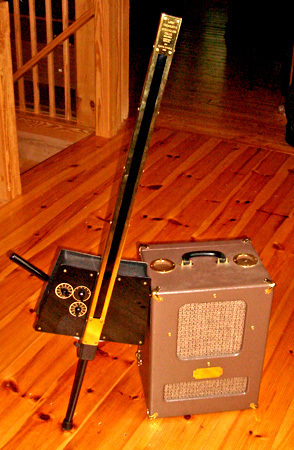 Here's a rare opportunity to own a rare replica of an even more rare instrument - the theremin cello! The theremin cello is one of Leon Theremin's lesser known creations. It features a touch-strip (the first ever?) along the neck used to control pitch and a lever along the side used to control volume. Tone control is available via knobs on the top plate. This particular model is a replica produced by artist/model maker/historian Floyd Engels, who is also known for making beautiful recreations of Clara Rockmore's diamond speaker. The seller is asking $5900 USD. Interested parties can contact John Terrey at JohnTerrey@aol.com for more information or to make offers.